Tracking particles created in subatomic smashups takes precision. So before the components that make up detectors at colliders like the Relativistic Heavy Ion Collider (RHIC) get the chance to see a single collision, physicists want to be sure they are up to the task. A group of physicists and students hoping to one day build a new detector at RHIC—a DOE Office of Science User Facility for nuclear physics research at the U.S. Department of Energy's Brookhaven National Laboratory—recently spent time at DOE's Fermi National Accelerator Laboratory putting key particle-tracking components to the test. "We want to do full jet reconstruction," said physicist Megan Connors, a member of the new sPHENIX collaboration building and testing components for a proposed upgrade to RHIC's PHENIX detector designed to transform it into a new state-of-the-art experiment. Connors spent time tracking "jets" as a graduate student and postdoc at RHIC and the Large Hadron Collider. Now a RIKEN-BNL Research Center Fellow who will begin teaching at Georgia State University next year, Connors says a new high-energy jet detector would offer the best opportunity to see deep into the hot particle soup created in RHIC's most energetic smashups. By adding up the energy of the sprays of particles emitted when high-energy quarks and gluons traverse the quark-gluon plasma, physicists hope to understand how its remarkable properties emerge from the individual quark and gluon interactions. The device that measures the energy of these jet particle sprays is called a calorimeter. To do a good job, it must completely surround the collision zone and be thick enough to catch all the particles. 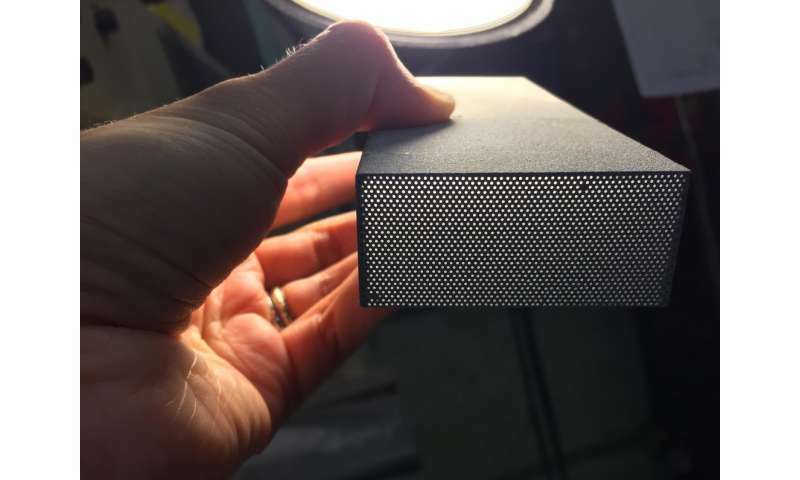 Anne Sickles, a physicist at the University of Illinois at Urbana-Champaign, has been working with her students and a company in San Diego to build electron- and light-sensing bricks for the inner layer, the "electromagnetic" calorimeter. They start with a tungsten powder that looks like black sand, placing fibers that look like straws into the powder. "Then we draw epoxy through it all to end up with bricks that have scintillating fibers running through them," she explained. "When a photon—a particle of light—hits these bricks, it starts to interact with the tungsten, and those interactions produce more photons and more interactions, like a chain reaction. Ultimately you get a shower with lots of light that travels down the length of the scintillating fibers to a silicon photomultiplier—a photo detector that changes the light to electric signals we read out. We use all this information to measure how much energy was in the initial photon." Getting that measurement right is crucial, Sickles explained, because when a photon is emitted from a particle collision back-to-back with a jet, it tells you how much energy the jet started with. The next step is determining how much energy the jet loses in its interactions with the quark-gluon plasma by measuring and adding up the energy of all the jet particles moving in the opposite direction. Photons and electrons would deposit all of their energy in the electromagnetic calorimeter. Heavier particles made of quarks, known as hadrons, deposit some energy in the electromagnetic calorimeter. But in many cases, they continue to fly right through. To stop them and measure their full energy, you need a hadronic calorimeter—the detector component Connors has been working on. "The hadronic calorimeter is made of two independent parts—the inner and outer hadronic calorimeters—which will be located just inside and outside the sPHENIX magnet," Connors said. "They consist of alternating layers of steel plates and angled scintillator tiles. "When particles hit the steel they lose energy and produce secondary particles, which 'excite' the tiles and make them emit light. A light-sensing fiber running through each tile collects the light so it can be read out by a silicon photomultiplier, just as is done for the electromagnetic calorimeter," she explained. The Test Beam Facility at Fermilab is the perfect place to put these components through their paces. Sickles was heavily involved in the first round of tests. She and her team built a prototype of the full electromagnetic calorimeter using 32 bricks, each made of two one-by-one-inch tungsten towers. Working with Brookhaven physicists who had connected these components to the electronic readouts, they placed an 8" by 8" grid of bricks into the path of a beam of electrons. Photons and electrons will both interact with the calorimeter in the same way and sPHENIX will use its capabilities to measure both kinds of particles. By tracking electrons, the sPHENIX electromagnetic calorimeter would also help physicists trace the interactions of "upsilon" particles with the quark-gluon plasma. "We use electron beams at various energies," Sickles explained. "Since we know what energy goes in and we measure what comes out, and the width of the distribution in energies, we can determine how good the resolution of the detector is. We are looking for a narrow peak—a tight correlation between what we put in and what we measure." They also took measurements to compare the response of bricks built by Sickles and postdoc Vera Loggins and several students at the University of Illinois with those built by Tungsten Heavy Powder, the company in San Diego. "The plan for the actual sPHENIX detector is to have 25,000 tungsten towers," Sickles said, "so we have to be sure they all have the same level of performance." Similar to the way the electromagnetic calorimeter was tested using an electron beam, the energy-resolution capabilities of the hadronic calorimeter were tested using a hadron beam of known energy. First the scientists did standalone tests to measure the hadronic calorimeters' performance alone. 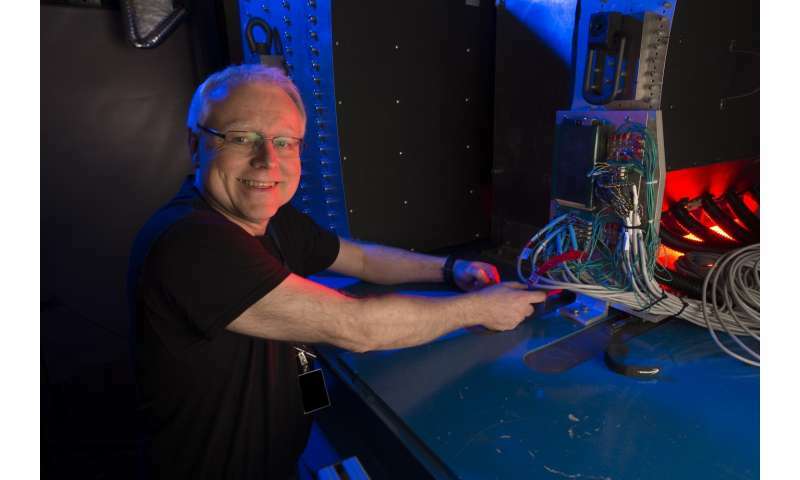 Following those studies, members of the sPHENIX team placed the prototype hadronic calorimeter components directly behind the electromagnetic mockup to study how the two detector layers would ultimately work together. "The tests of the hadronic calorimeter with the electromagnetic calorimeter in front of it measure the performance we would expect to see in sPHENIX," Connors said. "We also placed metal in between the inner and outer hadronic calorimeters to simulate the material of the magnet. "It's really coming to life," said Connors, who has been analyzing the data from the prototype testing. "It's great to be able to access the data from these tests remotely so people all over the world can be involved if they want. "We will take what we learn about how well the detector will perform based on the testing at Fermilab, and then use that knowledge to finalize the design," she said. The electromagnetic and hadronic calorimeter prototypes were assembled at Brookhaven Lab by technicians Carter Biggs, Sal Polizzo, Mike Lenz, and Frank Toldo under the direction of Brookhaven physicists John Haggerty, Jin Huang, Edward Kistenev, Eric Mannel, and Craig Woody, and physics associate Sean Stoll. The prototypes, designed and engineered by Richie Ruggiero, incorporated electronics designed by Steve Boose and data acquisition software provided by Martin Purschke. John Lajoie and Abhisek Sen of Iowa State University and Ron Belmont from the University of Colorado worked closely with the Brookhaven team on the hadronic calorimeter construction and analysis. Mandy Rominsky and Todd Nebel of the Fermilab Test Beam Facility were also instrumental in the success of the tests. sPHENIX R&D is supported by the DOE Office of Science and also by Brookhaven Lab's Laboratory Directed Research and Development program, BNL Program Development, and in-kind contributions from collaborating universities.